In 2014, it seemingly didn’t matter who Bishop Miege High School squared off against on the gridiron. The Stags won all but one game a year ago by double digits en route to the Kansas 4A State Championship and a perfect 13-0 record. Bishop Miege took to the road in their first game of the season. After traveling to Blue Valley Northwest to open the season and defeating the Huskies, 51-36, the Stags would return for their home opener against Gardner Edgerton. After defeating the Trailblazers, 29-0, Bishop Miege would host Blue Valley in arguably one of the more anticipated games when the 2014 season was announced. 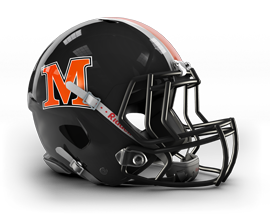 The 5A Tigers were coming off a dramatic 2013 season in which they rallied late in the year to capture the 2013 Kansas 5A Championship. A game between two perennial contenders early in the season was dominated by Bishop Miege and their quarterback Ryan Willis, who tossed four first half touchdowns as the Stags built a 42-7 halftime lead. Bishop Miege defeated Blue Valley, 42-21 behind Willis’ four touchdowns and 284 yards through the air. 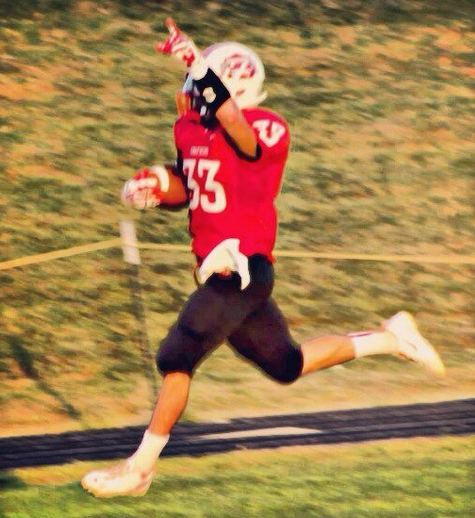 Running back Dawson Downing ran for 96 yards and two touchdowns in the rout. After their victory over the defending 5A champs, the 2014 season expectations skyrocketed. 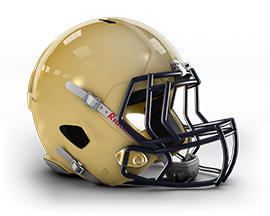 The Stags would handle perpetual title contender, and eventual Class 5A runner-up St. Thomas Aquinas by a score of 37-20 before allowing a mere 47 points in their final five games of the regular season. Included in their season ending tear, Bishop Miege defeated Blue Valley West (35-7), Blue Valley Southwest (53-14), Louisburg (41-14), Sumner Academy (51-12) and shut out Spring Hill, 51-0. The run didn’t falter at all to start the playoffs as the Stags continued their impressive play with back-to-back shut out victories in their first two postseason games. After cruising past Basehor-Linwood, 63-0 in a game that saw seven different Stags’ score a touchdown, Bishop Miege defeated Fort Scott, 47-0, gaining 587 total yards on offense. The Stags then played Piper in the 4A Kansas Sub-State Championship game and the rite to move on to the State Finals. 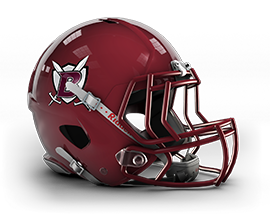 The Pirates had allowed a grand total of 113 points in their previous 11 games before meeting Bishop Miege. However, Downing and the Stag offense would prove to be too much to handle for the Pirates. The junior running back ran for four first half touchdowns and Willis would add two passing touchdowns in the first quarter as Bishop Miege cruised past Piper, 62-7. The Stags were Kansas 4A Sub-State Champions and would take on Hayden, who were playing in their first state title game since winning the 2008 4A Championship. In true championship form, Bishop Miege shook off a rusty first quarter in which they were shut out and answered with 21 points in the second before heading to halftime up, 21-14. The teams would battle it out in the early stages of the third, exchanging touchdown drives before it was tied at 28 points with 2:54 left. Downing would break the tie with just 0:39 remaining in the third quarter to give the Stags a seven point advantage heading in to the final quarter. After forcing a quick three and out after missing a field goal of their own to start the quarter, Bishop Miege’s second possession of the final frame would be the ultimate deciding factor. Willis would hit Nolan Gray for 17 yards and a touchdown with 7:55 left, giving the Stags a 42-28 lead. On the ensuing possession, Vincent Stephenson would intercept a Hayden pas that would kill the Wildcats drive. Despite not being able to muster much offensively on their next drive, the Stags did eat up over a minute on the clock and force Hayden to use their timeouts. 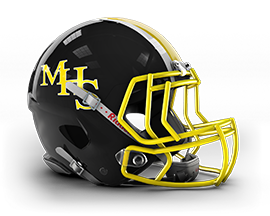 Jacob Head would hit Mason Dodd for nine yards and a touchdown on the subsequent possession with 0:41 seconds remaining to cut the lead to 42-35 for the Stags. However, after the onside kick was recovered by Bishop Miege and one Willis kneel down later, that 42-35 margin would crown the Stags as champions of Kansas’ 4A Division. Miege recovers onside, runs out clock. Bishop Miege 42, Hayden 35. Congratulations to both teams. The victory over Hayden marked the first time in school history that Bishop Miege would finish their season undefeated with a State Championship. It also marked the fifth state title in school history. The Stags leader, Willis, signed his letter of intent to play for the University of Kansas just last week on National Signing Day. Bishop Miege will look to continue their success from 2014 but will have some big shoes to fill as their 6-foot-4 signal-caller is now a Jayhawk. 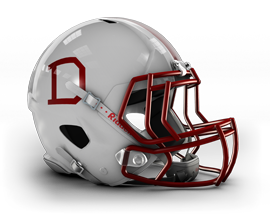 Nevertheless, coach Holmes will certainly have his team ready to go in the fall when the season starts and gladly accept the challenges of defending a State Championship. While the majority of high school seniors had decided where they would attend college in the fall, some top notch players had yet to decide, or make their college choice public, before National Signing Day. That all changed Wednesday as Signing Day came and went, signifying the deadline to fax in your letter of intent. On NSD, one of the biggest names on many lists finally made it known where he’ll be, come the fall. That player is offensive guard and highly sought after Olathe South High School senior, Braden Smith. Despite not knowing much on his decision, the general consensus on Smith was that he was down to three schools – Auburn, Texas A&M and TCU – with the reigning SEC Champions as the team to beat. That premonition came to be true as the 6-foot-6, 275-pounder faxed in his letter on intent to the Auburn Tigers Wednesday afternoon, pledging his services for his college years. Smith, a two-way player for Olathe South, will turn his focus to offense as he looks to anchor a Tiger offense that nearly ran their way to a National Championship victory last season. Smith had dozens of offers from Football Bowl Subdivision (FBS) teams but did in fact narrow his choices down to A&M, TCU and Auburn before ultimately selecting the Tigers on a national broadcast. "It was a very difficult decision because those are great schools," Smith said. "It was a close race for all three of them but I felt like Auburn was the best fit for me." 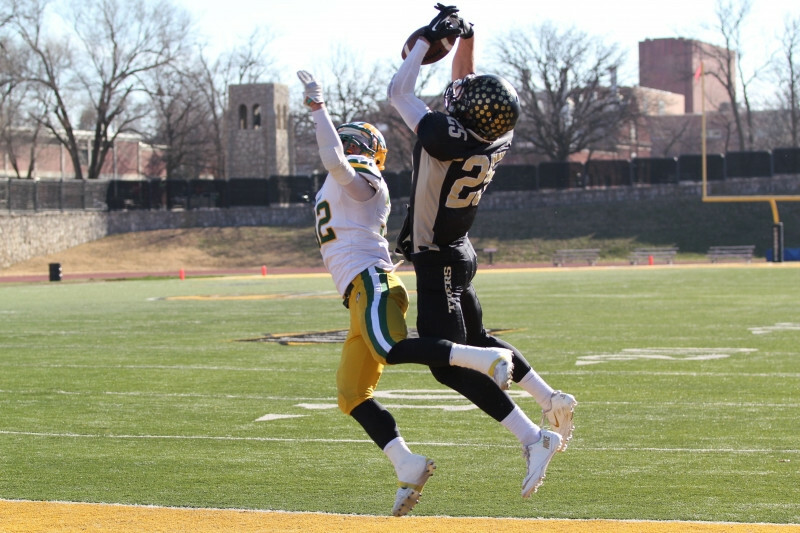 Smith joins fellow Kansas high school players and HSGameCenter users Henry McGrew (Blue Valley), Jimmie Swain (Olathe North), Austin Chambers (Shawnee Mission West) and Traevohn Wrench (Gardner Edgerton), as players to sign with FBS teams. Be sure to follow along on Facebook or Twitter (@HSGameCenter) for up to the minute news. This football season, millions of fans logged onto HSGameCenter.com for high school play-by-play statistics. And what they saw was live data streaming in from all across the country from thousands of teams, including 24 who won state football titles and 14 state runner ups. Additionally, 2 are playing for championships this weekend - Booneville and Cisco. Congrats to all of our teams and their fans on a successful 2013 campaign. 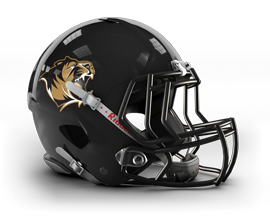 The Kansas Class 5A Playoffs have come to an end with the Blue Valley High School Tigers knocking off the South Cougars from Salina, Kansas. 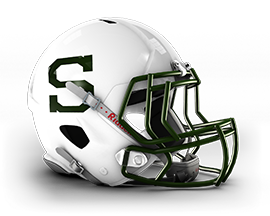 The ending did not come without drama as the Tigers had to stop South on a final 2-point conversion attempt late in the fourth quarter, to hold on to the victory – their sixth state championship in school history. For their efforts in winning the 5A Championship, Blue Valley has been selected as the HSGC National Team of the Week. Blue Valley seemed to have the game in hand early as they jumped out to a 24-6 halftime lead. The Tigers held the Cougars to just 10 yards in the third quarter and kicked a field goal of their own to increase their lead to 27-6 heading into the final frame. The fourth quarter was a different story as the Cougars scored on the second play of action. 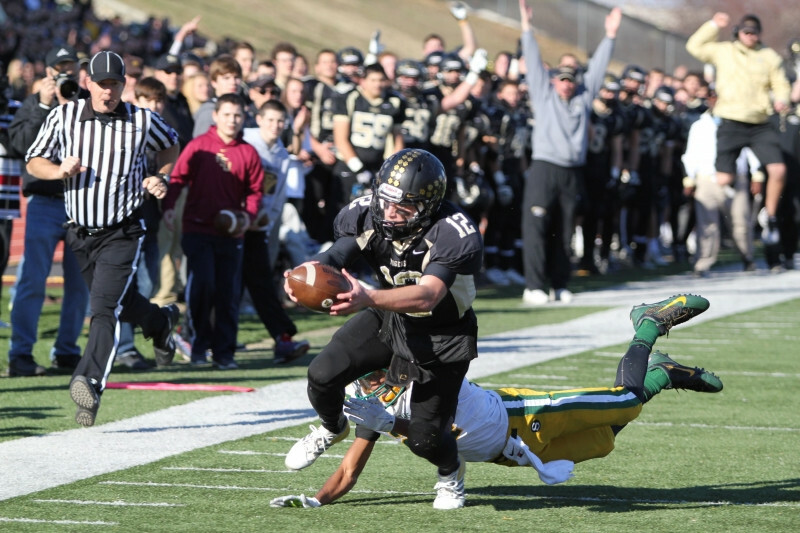 After holding Blue Valley to a fourth-down turnover, South scored with 5:05 left, edging closer to the Tigers. 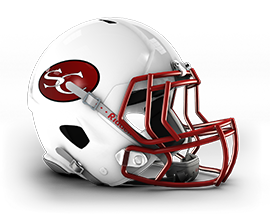 Instead of kicking off to a potent Tiger offense, South would recover an onside kick and turn that in to a touchdown with just 1:13 left. Up by just one point, 27-26, Blue Valley watched as South lined up to go for two, rather than kick the game-tying extra point. It was there that the Tigers made their most important stand of the season. 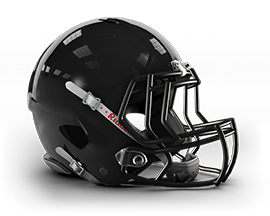 Blue Valley held South out of the end zone after Cougar wide receiver Zach Nachbar took a reverse pass and heaved a pass into the end zone. As the pass hit the ground, incomplete, it was then that Blue Valley could sense the Championship. A recovery of an onside kick attempt, and the Tigers were a mere kneel down away from the Championship. 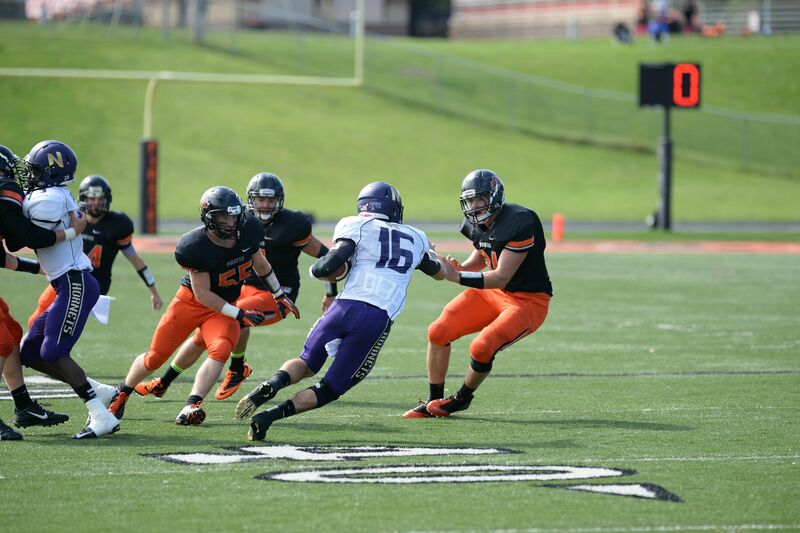 The Tigers were paced by quarterback Logan Brettell who had a hand, or foot, in each of the team’s 27 points. 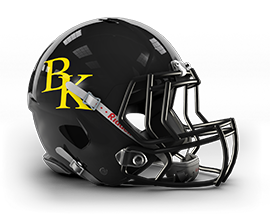 Brettell scored the first touchdown of the game, hitting receiver Mikey Henson for a 29-yard touchdown. That score was set up by an interception by Brandon Lee on South’s first play from scrimmage. Brettell would notch two rushing scores of 18 and four yards in the second quarter. In addition to his touchdowns, Brettell also kicked all three extra points, added two field goals (20, 27 yards) and punted three times for 111 yards, each punt pinning the Cougars inside their own 20-yard line. The Tigers and their coaching staff appreciate the support they’ve received from their community this season and are very optimistic for years to come. They say that actions speak louder than words and that arguably has never been more accurate than with Ryan Schadler from Hesston High School in Kansas. Due to his actions on the field this past weekend, Schadler has been selected as the National HSGC Player of the Week. Schadler, a senior running back for the Hesston Swathers, has been the workhorse for Hesston this season as he has handled rushing, receiving and punting duties on the offensive side as well as grabbing two interceptions while playing on the defensive side of the ball in 2013. 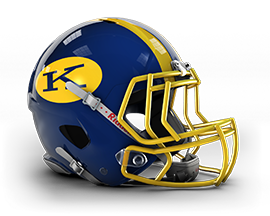 In his most recent outing against Kingman High School, Schadler carried the ball 19 times for 285 yards, scoring five times on the ground. Schadler’s scoring plays came on runs of 12, 34, 51, 65, 74 yards but it was the 65-yard scamper early in the 2nd quarter that proved to be the much needed spark for the Swathers offense. Down 21-6, Hesston found themselves trailing in a game for the first time of the season. Schadler took a carry through the middle and bounced it outside for a 65-yard touchdown run that energized the team. After Schadler’s long touchdown run, the Swathers outscored Kingman 35-6 en route to a 41-27 victory. If rushing for five touchdowns in a game isn’t enough, Schadler also hauled in a 6-yard touchdown reception before halftime as Hesston closed out the second quarter scoring 19 unanswered points and took a 25-21 lead into the break. He also punted the ball five times for 131 yards and registered his second interception of the season against Kingman. On the year, Schadler now has 74 carries for 1,341 yards and 21 touchdowns on the ground. He has accrued three receiving touchdowns on only eight receptions. 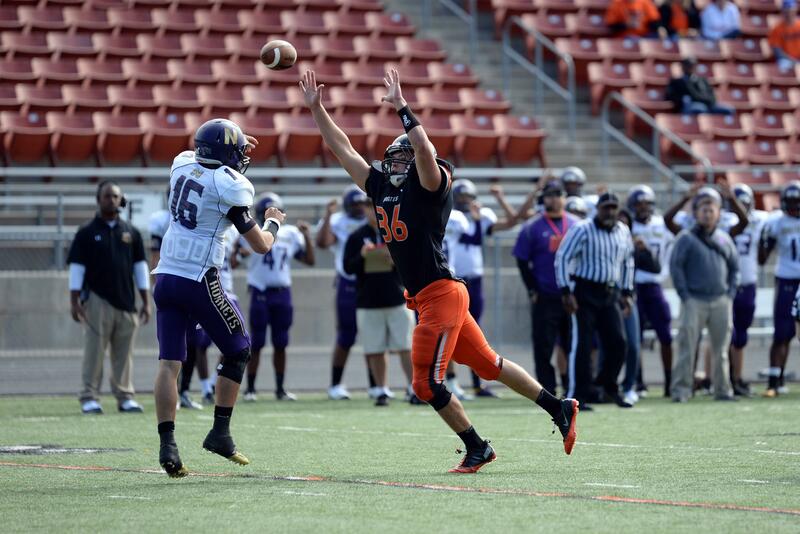 He has punted the ball five times inside the opponent’s 20-yard line and also returned a punt for a touchdown. 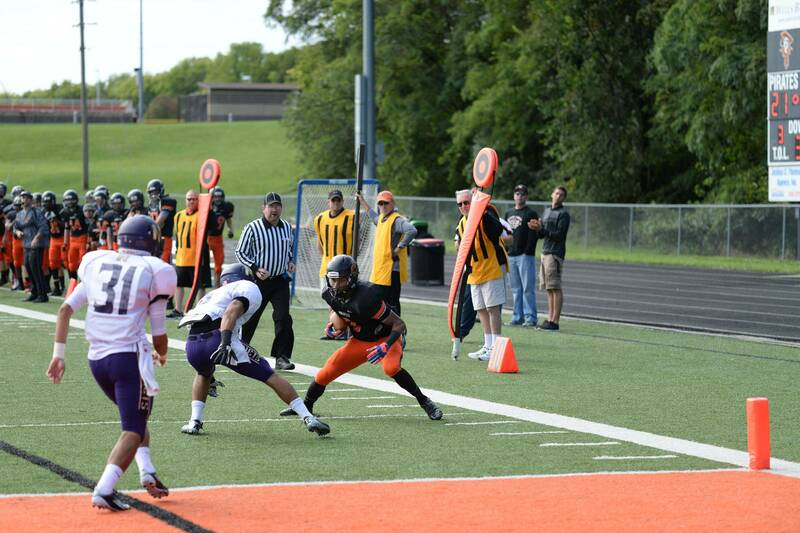 The Platte County Pirates utilized a strong effort in a fourth quarter played a day later against North Kansas City to knock off the Hornets, 42-21. The Pirates got back in the win column this week and their dominating performance in the final frame won them the recognition of the National HSGC Team of the Week. A hard fought game throughout, the first half was a back-and-forth battle that saw each team hold a lead before heading into the break tied at 14 points apiece. 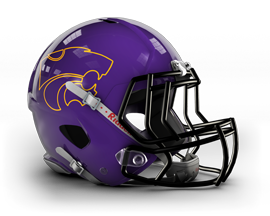 North Kansas City took the lead early in the first quarter on a six-yard touchdown pass from Bryce Graskemper to Donardto Majok. Tyler Cooper would score on consecutive drives in the second quarter to give the Pirates a 14-6 advantage before the Hornets tied things up at the half. The third quarter was much of the same while each team took turns with the ball but had no luck punching it in for any points. It was not until the next day, the continuation of the fourth quarter, that scoring resumed. After play was suspended with 10:38 left in the fourth quarter due to lightning, the game resumed on Saturday at noon, bringing with it scoring plays in a hurry. 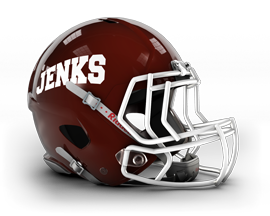 On the first play of the postponed fourth quarter, cornerback Johnny Blankenship intercepted a Graskemper pass and returned it for a touchdown. After the Hornets quickly brought the game back to a tie at 21-21, Cooper and the Pirates would notch two more offensive scores in the final period. 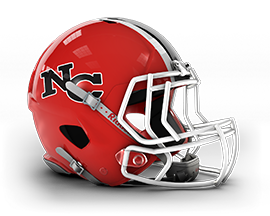 One score was through the air while the other was after a time-consuming drive that culminated with a 7-yard Nic Blaha touchdown run. That gave the Pirates a decisive 14-point edge with just over a minute remaining. Down 35-21, the Hornets continued to pressure on their last possession of the game and the Pirates defense continued to answer. With a mere four seconds left, another Graskemper pass would be intercepted and returned for another touchdown, this time by Tyler Clemins for 100 yards, in what was the icing on the cake. A hard fought 42-21 victory would be the outcome but was not indicative of how tough both teams actually played in the two-day event. “The game was a crazy game,” Utz said. “It was far from a normal game. The game was much closer than the score indicated. I feel the time off and long delay helped us, mainly because we were the home team. The delay did allow us to regroup, but we did not change anything or (have) any extra prep.